Hi everyone! I came up with this recipe on a whim. I don't know about you all, but I absolutely adore squash! I think butternut squash is one of the absolute best. It's savory, sweet, has a wonderful depth of flavor, and is so versatile! You can do so much with it, and can take it in so many culinary directions. Now, I am a "spoonie." If you don't know what that is, please feel free to search for "the spoon theory." What it basically comes down to is having a chronic illness. As a result, any cooking I do is usually in big batches, so I have leftovers to eat for a few days. 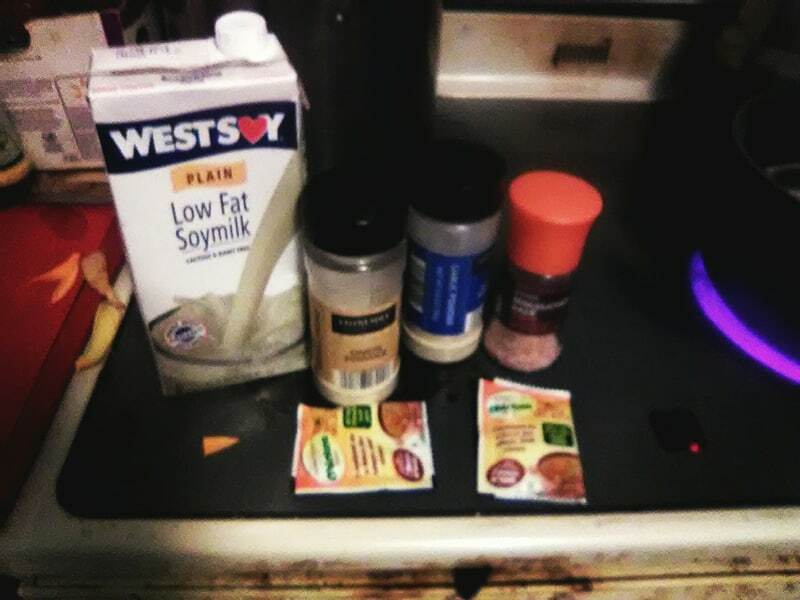 Also, I try to make the prep as simple as possible, and not use an extensive list of ingredients. I try to use more affordable ingredients as well since I'm on a tighter budget (hence my previous post about veganism on a budget). 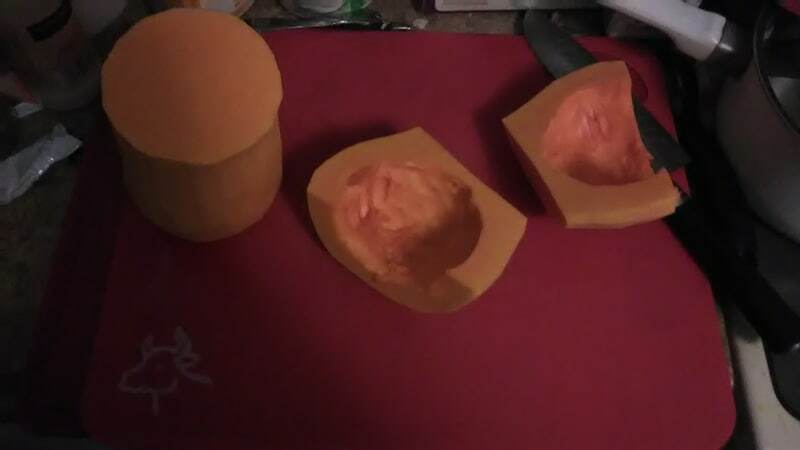 This looks like it has a lot of steps, but I assure you, it's really quite simple, and came together in a couple hours. Someone who is more able should has this cooked quite quickly. 1. add the flour and oil to a 2 quart sauce pan, or other pot that holds at least 2 quarts. 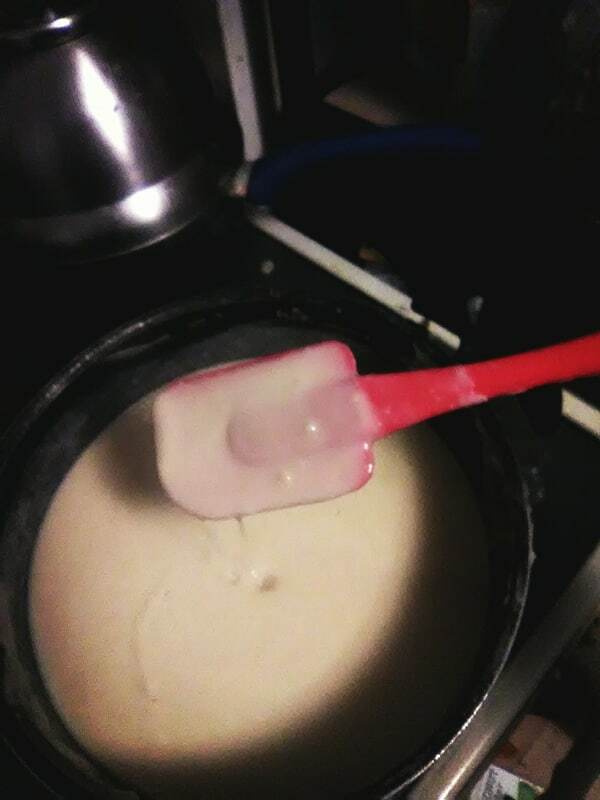 2. using a whisk or spatula, blend the oil and flour thoroughly. When mixed, turn the burner on medium to medium high heat. 3. stir the flour mixture frequently, making sure to scrape the bottom of the pot well, until it becomes well toasted and is a light or golden brown. 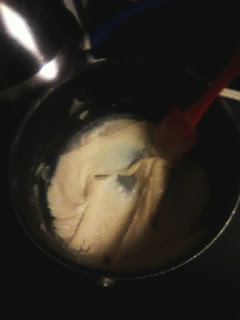 (you want your mixture to have a good color to it, as this will give your sauce a good depth of flavor.) This will take at least several minutes, it's hard to give a good estimate, as our stove is a bit wonky. 4. When the mix has toasted for several minutes, and has a good color, turn your burner down to medium to medium low hear. Then very slowly start to whisk in all of the soy milk. 5. 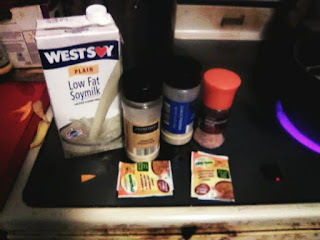 Add your salt, pepper if using, garlic and onion powders, and chicken broth powder. Adjust the seasonings to taste. Make sure it is seasoned very well, as the rest of your ingredients will absorb the flavor of the sauce. If your sauce is too thick, you can thin it out with some water. (You want the thickness to be like a semi-runny spaghetti sauce.) Set your sauce aside. 1.Preheat your oven to 375 degrees. 2. wash the squash thoroughly. 3.. trim the top and bottom from the squash. 4. use a spoon to remove the seeds and membrane from the inside of the squash. 5. using a vegetable peeler, peel the skin from the squash. You want to peel enough to expose most of the solid orange portion of the squash, removing as much of the peach-colored layer, and the green stringy bits as you can. 6. Place the squash on it's side on a cutting board. 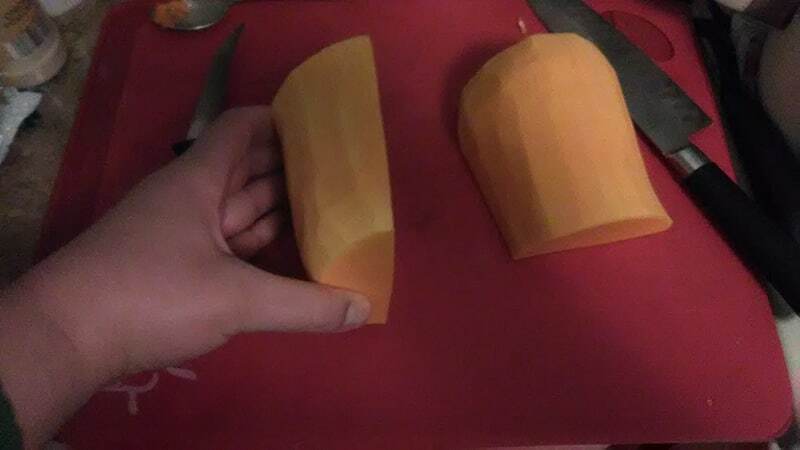 Using a chefs knife, or other long sturdy knife, slice through the squash width wise just above the round, bottom portion, separating it into two sections. 7. Stand the bottom portion upright, and cut length-wise into quarters. Do the same with the top portion of the squash. 8. Take each quarter of the squash, and slice it into pieces that are about 1/8-1/4 of an inch. Set the squash aside. 9. Spray a 9 x 13 inch pan well with cooking spray. 10. Break the spaghetti in half, and place in the bottom of the pan. Add enough water to the pan so that there is about 1/2 of an inch of water above the pasta. Season the noodles with about 1/2 teaspoon of salt, and pepper if desired. 11. 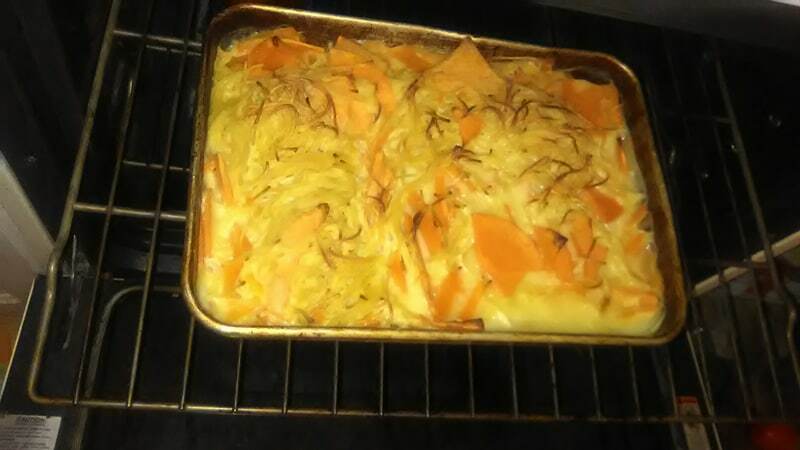 Distribute the pieces of squash above the noodles. Cover the pan with foil, and bake for 20 minutes, or until the pieces of squash are just starting to become fork tender. 12. Remove from the oven, and add the bechamel to the pan. Using a spatula, very gently fold the sauce into the noodles and squash. It doesn't have to be mixed in super thoroughly, just enough so that it's not strewn on top of everything. 13. Return to the oven, and bake uncoverd for about 20-25 minutes, or until the squash is fork tender, and the top is starting to brown. I LOVE me some butternut squash and this seems like a really simple recipe! Will definitely have to give it a try! Thanks for sharing!!! I so love this.I like the simplicity of this recipe.It's something i can try(i rarely cook)and it looks delicious too. This looks really yummy. A healthy dinner for my family that I will have make soon. Butternut Squash it a fall favorite and a Bechamel sauce is always yummy. Few ingredients and quick meals? sign me up! This is exactly what I like.